Mikhail Alexandrovich Bakunin (Russian—Михаил Александрович Бакунин, Michel Bakunin—on the grave in Bern), (May 18 (May 30 N.S. ), 1814–June 19 (July 1 N.S. ), 1876) was a well-known Russian revolutionary, and one of the leading figures of nineteenth-century anarchism." Born an aristocrat, in his youth he was attracted to the idealist philosophies of Kant, Schelling, Fichte, and Hegel. He begged to be allowed to study philosophy in Germany; once there he encountered the Left Hegelians and soon devoted himself to promoting political and social revolution. After escaping exile in Siberia, where he was sent as punishment for promoting the revolution against the Russian government, he “converted” to anarchism in 1865 and helped to formulate many of the philosophical principles of modern anarchism. Politically he rejected every form of government and external authority, whether emanating from the will of a sovereign or from universal suffrage. He also rejected the notion of any privileged position or class, instead theorizing a “new class” of administrators who would be nothing more than servants of society. His philosophy of anarchism was based on interrelated concepts of liberty, socialism, federalism, anti-theism, and materialism. He proposed collectivist anarchism, in which state and private ownership of the means of production would be abolished, and the means of production would instead be owned collectively and controlled and managed by the producers. 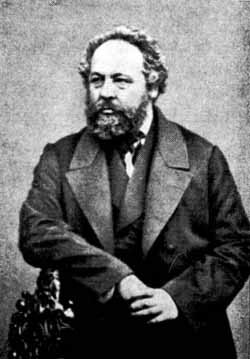 Although Bakunin accepted Marx’s class analysis and economic theories regarding capitalism, he criticized “authoritarian socialism” (Marxism) and the concept of “dictatorship of the proletariat,” predicting that if the Marxists were successful in seizing power, they would create a party dictatorship "all the more dangerous because it appears as a sham expression of the people's will," which in fact became a reality in many socialist countries. Mikhail Alexandrovich Bakunin was born May 30, 1814, to an aristocratic family in the village of Pryamukhino (Прямухино) between Torzhok (Торжок) and Kuvshinovo (Кувшиново), in Tver guberniya, northwest of Moscow, Russia. At the age of fourteen he went to St. Petersburg for military training at the Artillery University. He completed his studies in 1832, and in 1834 was commissioned a junior officer in the Russian Imperial Guard and sent to Minsk and Gardinas in Lithuania (now Belarus). That summer, Bakunin became embroiled in a family argument, taking his sister’s side when she rebelled against an unhappy marriage. Though his father wished him to continue in either the military or the civil service, Bakunin abandoned both in 1835, and made his way to Moscow, hoping to study philosophy. In Moscow, Bakunin soon became friends with a group of former university students, who engaged in the systematic study of idealist philosophy, grouped around the poet Nikolay Stankevich, “the bold pioneer who opened to Russian thought the vast and fertile continent of German metaphysics” (E. H. Carr). Initially their study centered on the philosophy of Kant, but then progressed to Schelling, Fichte, and Hegel. By autumn of 1835, Bakunin had decided to form a philosophical circle in his home town of Pryamukhino, which generated much enthusiasm among the young people involved. One of its members, Vissarion Belinsky, fell in love with one of Bakunin’s sisters. By early 1836, Bakunin was back in Moscow, where he published translations of Fichte’s Some Lectures Concerning the Scholar's Vocation and The Way to a Blessed Life, which had become his favorite book. With Stankevich he also read Goethe, Schiller, Jean Paul, and E.T.A. Hoffmann. He became increasingly influenced by Hegel and provided the first Russian translation of his work. During this period he met the socialists Alexander Herzen and Nikolay Ogarev, and the slavophiles Konstantin Aksakov and Piotr Tschaadaev, and began to develop his panslavic views. After long discussions with his father, Bakunin went to Berlin in 1840, hoping to become a university professor (a “priest of truth,” as he and his friends imagined it). He soon encountered the radical students of the so-called “Hegelian Left,” and joined the socialist movement in Berlin. In his 1842 essay The Reaction in Germany, he argued in favor of the revolutionary role of negation, summed up in the phrase, "the passion for destruction is a creative passion." After three semesters in Berlin, Bakunin went to Dresden where he became friends with Arnold Ruge. Here he also read Lorenz von Stein's Der Sozialismus und Kommunismus des heutigen Frankreich and developed a passion for socialism. He abandoned his interest in an academic career, devoting more and more of his time to promoting political and social revolution. The Russian government, hearing of his radicalism, ordered him to return to Russia; when he refused, his property was confiscated. Bakunin then went with Georg Herwegh to Zürich, Switzerland. During a six-month stay in Zürich, Bakunin became closely associated with German communist Wilhelm Weitling. He remained on friendly terms with the German communists until 1848, occasionally calling himself a communist and writing articles on communism in the Schweitzerische Republikaner. Shortly before Weitling was arrested by the government, Bakunin moved to Geneva in western Switzerland. His name had appeared frequently in Weitling's correspondence, which was seized by the police, and reports were circulated to the tzarist police. The Russian ambassador in Berne ordered Bakunin to return to Russia, but instead he went to Brussels. There he met leading Polish nationalists, such as Joachim Lelewel, but clashed with them over their demand for a historic Poland based on the borders of 1776, defending the right of autonomy for the non-Polish peoples in these territories. He did not support their religious loyalties, and they did not support his calls for the emancipation of the peasantry. In 1844 Bakunin went to Paris, then a center for European radicalism. He established contacts with Karl Marx and the anarchist Pierre-Joseph Proudhon, who greatly impressed him and with whom he formed a personal bond. In December 1844, Tsar Nikolai I issued a decree stripping Bakunin of his privileges as a noble, denying him civil rights, confiscating his land in Russia, and condemning him to life-long exile in Siberia, if he was ever captured by the Russian authorities. He responded with a long letter to La Réforme, denouncing the Tsar as a despot and calling for democracy in Russia and Poland. In March, 1846, in another letter to the Constitutionel, he defended Poland, following the repression of Catholics there. Some Polish refugees who had fled Kraków, following the defeat of the uprising there, invited him to speak at a meeting in November 1847 commemorating the Polish November Uprising of 1830. In his speech, Bakunin called for an alliance between the Polish and Russian peoples against the Tsar, and looked forward to "the definitive collapse of despotism in Russia." As a result, he was expelled from France and returned to Brussels. “Since 1846 the Slavo-Polish cause has become my idée fixe.” Bakunin's Letter to Herzen and Nikolay Ogarev Bakunin attempted unsuccessfully to draw Alexander Herzen and Vissarion Belinsky into conspiratorial action for revolution in Russia. In Brussels, Bakunin renewed his contacts with revolutionary Poles and Karl Marx. He spoke at a meeting organised by Lelewel in February 1848 about a great future for the slavs, whose destiny, he said, was to rejuvenate the Western world. Around this time, the Russian embassy attempted to discredit Bakunin by circulating rumors that he was a Russian agent who had exceeded his orders. He went on to Berlin, but was stopped by the police from going to Posen, part of Prussian-occupied Poland, where the nationalist Wielkopolska Uprising (1848) was taking place. Instead Bakunin went to Leipzig and Breslau, then to Prague where he participated in the First Pan Slav Congress. The Congress was followed by an abortive insurrection, the May Conspiracy, that Bakunin had sought to promote and intensify but which was violently suppressed. He returned to Breslau, where Marx republished the allegation that Bakunin was a Tsarist agent, claiming that George Sand had proof. Marx retracted the statement after George Sand came to Bakunin's defense. In the fall of 1848, Bakunin published his Appeal to the Slavs, in which he proposed that Slav revolutionaries unite with Hungarian, Italian and German revolutionaries to overthrow the three major European autocracies, the Russian Empire, the Austro-Hungarian Empire, and the Kingdom of Prussia. Bakunin played a leading role in the May Uprising in Dresden in 1849, helping to organize the defense of the barricades against Prussian troops with Richard Wagner and Wilhelm Heine. He was captured in Chemnitz and held for thirteen months, before being condemned to death by the government of Saxony. However, because he was also wanted by the governments of Russia and Austria, his sentence was commuted to life. In June 1850, he was handed over to the Austrian authorities. Eleven months later he received a further death sentence, but this too was commuted to life imprisonment. Finally, in May 1851, Bakunin was handed over to the Russian authorities. On reading the letter, Tsar Nicholas I, remarked, “He is a good lad, full of spirit, but he is a dangerous man and we must never cease watching him.” This confession, which was only published following its discovery in the tsarist archives, has proved to be quite controversial, and is sometimes analyzed within the context of a specifically Russian literary genre. After three years in the underground dungeons of the Fortress of St Peter and St Paul, he spent another four years in the castle of Shlisselburg. Here he suffered from scurvy, and all his teeth fell out as a result of the appalling diet. He later recounted that he found some relief in mentally re-enacting the legend of Prometheus. His continuing imprisonment in these awful conditions led him to entreat his brother to supply him with poison. Following the death of Nikolai I in February 1855, the new tsar Alexander II of Russia personally struck his name off the amnesty list. However in February 1857, his mother's pleas to the Tsar were finally heeded and he was allowed to go into permanent exile in the western Siberian city of Tomsk. 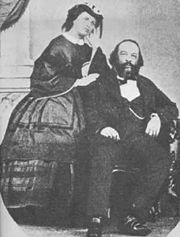 Within a year of arriving in Tomsk, Bakunin married Antonia Kwiatkowska, the daughter of a Polish merchant, whom he had been instructing in French. In August of 1858 Bakunin received a visit from his second cousin, General Count Nikolay Muravyov-Amursky, who had been Governor of Eastern Siberia for ten years. Muravyov was a liberal and Bakunin, as his relative, became his particular favorite. In the spring of 1859, Muravyov helped Bakunin to get a job with the Amur Development Agency, which enabled him to move with his wife to Irkutsk, the capital of Eastern Siberia. The move enabled Bakunin to be part of the circle involved in political discussions centered on Muravyov's colonial headquarters. Resenting the treatment of the colony by the bureaucracy in Saint Petersburg, including its use as a dumping ground for malcontents, the group developed a proposal for a United States of Siberia, independent of Russia and federated into a new United States of Siberia and America, following the example of the United States of America. The circle included Muravyov's young Chief of Staff, Kukel, who, according to Peter Kropotkin, possessed the complete works of Alexander Herzen, the civil governor Izvolsky, who allowed Bakunin to use his address for correspondence; and Muravyov's deputy and eventual successor, General Alexander Dondukov-Korsakov. When Herzen criticized Muravyov in The Bell, Bakunin wrote vigorously in his patron's defense. Bakunin tired of his job as a commercial traveler, but due to Muravyov's influence, was able to keep his sinecure (worth 2,000 rubles a year) without having to perform any duties. Muravyov was forced to retire from his post as governor general, partly because of his liberal views and partly due to fears he might take Siberia towards independence. He was replaced by Korsakov, who perhaps was even more sympathetic to the plight of the Siberian exiles. Korsakov was also related to Bakunin through a cousin who had married Bakunin's brother Paul. Taking Bakunin's word as security, Korsakov issued him with a letter giving him passage on all ships on the river Amur and its tributaries as long as he was back in Irkutsk when the ice came. On June 5, 1861, Bakunin left Irkutsk on a business trip, ostensibly employed by a Siberian merchant to make a trip to Nikolaevsk. By July 17, he was on board the Russian warship Strelok bound for Kastri. However, in the port of Olga, Bakunin managed to persuade the American captain of the SS Vickery to take him on board. Although he encountered the Russian Consul on board, Bakunin was able to sail away under the nose of the Russian Imperial Navy. By August 6, he had reached Hakodate in the northernmost Japanese island of Hokkaidō and was soon in Yokohama. They arrived in San Francisco on October 15. In the period before the trans-continental railroads had been completed, the quickest way to New York was via Panama. Bakunin boarded the Orizaba for Panama, where after waiting for two weeks he boarded the Champion for New York. In Boston, he visited Karol Forster, a partisan of Ludwik Mieroslawski during the 1848 Revolution in Paris, and caught up with other "Forty-Eighters" (veterans of the 1848 revolutions in Europe), such as Friedrich Kapp. He then sailed for Liverpool, arriving on December 27, and immediately went to London to see Herzen. That evening, he burst into the drawing-room where the Herzen family was having supper, saying, "What! Are you sitting down eating oysters! Well! Tell me the news. What is happening, and where?!" After returning to Europe, Bakunin immediately immersed himself in the revolutionary movement. In 1863, he joined a revolutionary expedition that was to aid a Polish insurrection against the Czar, but the insurrection was defeated and Bakunin ended up in Sweden. In 1864 he traveled to Italy, where he first began to develop his anarchist thought. He conceived the plan of forming a secret organization of revolutionaries to carry on propaganda work and prepare for direct action. He recruited Italians, Frenchmen, Scandinavians, and Slavs into the International Brotherhood, also called the Alliance of Revolutionary Socialists. In July, 1866, he informed Herzen and Ogarev about the fruits of his work over the previous two years; his secret society then had members in Sweden, Norway, Denmark, Belgium, England, France, Spain, and Italy, as well as Polish and Russian members. In his Revolutionary Catechism of 1866, Bakunin opposed religion and the state, advocating the "absolute rejection of every authority including that which sacrifices freedom for the convenience of the state." In the period from 1867 to1868, Bakunin responded to Emile Acollas's call and became involved in the League of Peace and Freedom (LPF), for which he wrote a lengthy essay Federalism, Socialism, and Anti-Theologism He advocated a federalist socialism, drawing on the work of Proudhon. He supported freedom of association and the right of secession for each unit of the federation, but emphasized that this freedom must be joined with socialism for, "Liberty without socialism is privilege, injustice; socialism without liberty is slavery and brutality." "the cry passed from mouth to mouth: 'Bakunin!' Garibaldi, who was in the chair, stood up, advanced a few steps and embraced him. This solemn meeting of two old and tried warriors of the revolution produced an astonishing impression …. Everyone rose and there was a prolonged and enthusiastic clapping of hands". At the Berne Congress of the League (1868) he and other socialists (Élisée Reclus, Aristide Rey, Jaclard, Giuseppe Fanelli, N. Joukovsky, V. Mratchkovsky and others) found themselves in a minority. They seceded from the League and established their own International Alliance of Socialist Democracy, which adopted a revolutionary socialist program. In 1869, the International Alliance of Socialist Democracy was refused entry to the First International, on the grounds that it was an international organization in itself, and only national organizations were permitted membership in the International. The Alliance dissolved and the various groups which it comprised joined the International separately. In 1870 Bakunin led a failed uprising in Lyon on the principles later exemplified by the Paris Commune, calling for a general uprising in response to the collapse of the French government during the Franco-Prussian War, and seeking to transform an imperialist conflict into social revolution. In his Letters to A Frenchman on the Present Crisis, he argued for a revolutionary alliance between the working class and the peasantry and set forth his formulation of what was later to become known as “propaganda of the deed”: "we must spread our principles, not with words but with deeds, for this is the most popular, the most potent, and the most irresistible form of propaganda." Bakunin was a strong supporter of the Paris Commune of 1871, which was brutally suppressed by the French government. He saw the Commune above all as a “rebellion against the State,” and commended the Communards for rejecting not only the State but also revolutionary dictatorship. In a series of powerful pamphlets, he defended the Commune and the First International against the Italian nationalist Giuseppe Mazzini, thereby winning over many Italian republicans to the International and the cause of revolutionary socialism. Although Bakunin accepted Marx’s class analysis and economic theories regarding capitalism, acknowledging “Marx’s genius,” he thought that Marx was arrogant, and that his methods would compromise the social revolution. More importantly, Bakunin criticized “authoritarian socialism” (Marxism) and the concept of “dictatorship of the proletariat,” which he adamantly rejected. Bakunin retired to Lugano in 1873 and died in Berne on June 13, 1876. Bakunin similarly rejected the notion of any privileged position or class, insisting that every individual had equal potential to contribute to society. Bakunin developed a prescient critique of Marxism, predicting that if the Marxists were successful in seizing power, they would create a party dictatorship "all the more dangerous because it appears as a sham expression of the people's will" (Michael Bakunin: Selected Writings, ed. A. Lehning (New York: Grove Press, 1974), 268). Bakunin's political beliefs were based on the interrelated concepts of liberty; socialism; federalism; anti-theism; and materialism. By "liberty," Bakunin did not mean an abstract ideal, but a concrete reality based on equal liberty for everyone. In a positive sense, he held that liberty consists of "the fullest development of all the faculties and powers of every human being, by education, by scientific training, and by material prosperity." Such a conception of liberty is "eminently social, because it can only be realized in society," not in isolation. In a negative sense, liberty is "the revolt of the individual against all divine, collective, and individual authority." Bakunin argued that "the idea of God implies the abdication of human reason and justice; it is the most decisive negation of human liberty, and necessarily ends in the enslavement of mankind, in theory and practice." Bakunin reversed Voltaire's famous aphorism that if God did not exist, it would be necessary to invent Him, writing instead that "if God really existed, it would be necessary to abolish Him." Bakunin denied religious concepts of "free will" and advocated a materialist explanation of natural phenomena: "the manifestations of organic life, chemical properties and reactions, electricity, light, warmth and the natural attraction of physical bodies, constitute in our view so many different but no less closely interdependent variants of that totality of real beings which we call matter" (Selected Writings, 219). The "mission of science is, by observation of the general relations of passing and real facts, to establish the general laws inherent in the development of the phenomena of the physical and social world." However, Bakunin rejected the notion of "scientific socialism," writing in God and the State that a "scientific body to which had been confided the government of society would soon end by devoting itself no longer to science at all, but to quite another affair... its own eternal perpetuation by rendering the society confided to its care ever more stupid and consequently more in need of its government and direction." Bakunin’s methods for realizing his revolutionary program were consistent with his principles. The workers and peasants were to organize on a federalist basis, "creating not only the ideas, but also the facts of the future itself.The worker's trade union associations would "take possession of all the tools of production as well as buildings and capital. The peasants were to "take the land and throw out those landlords who live by the labor of others." Bakunin looked to "the rabble," the great masses of the poor and exploited, the so-called "lumpenproletariat," to "inaugurate and bring to triumph the Social Revolution," as they were "almost unpolluted by bourgeois civilization." The dispute between Mikhail Bakunin and Karl Marx highlighted the differences between anarchism and Marxism. Bakunin was decidedly anti-Marxist. He wrote that, "They [the Marxists] maintain that only a dictatorship—their dictatorship, of course—can create the will of the people, while our answer to this is: No dictatorship can have any other aim but that of self-perpetuation, and it can beget only slavery in the people tolerating it; freedom can be created only by freedom, that is, by a universal rebellion on the part of the people and free organization of the toiling masses from the bottom up. "—Mikhail Bakunin, Statism and Anarchism While both anarchists and Marxists shared the goal of creating a free, egalitarian society without social classes or government, they strongly disagreed on how to achieve this goal. Anarchists believed that the classless, stateless society should be established by the direct action of the masses, culminating in social revolution, and refused any intermediate stage such as the dictatorship of the proletariat, on the basis that such a dictatorship would become self-perpetuating. Bakunin perceived the fundamental contradiction that for the Marxists, "anarchism or freedom is the aim, while the state and dictatorship is the means, and so, in order to free the masses, they have first to be enslaved." Bakunin was perhaps the first to theorize a "new class" of intellectuals and administrators who would form the bureaucratic apparatus of the state. Bakunin argued that the "State has always been the patrimony of some privileged class: a priestly class, an aristocratic class, a bourgeois class. And finally, when all the other classes have exhausted themselves, the State then becomes the patrimony of the bureaucratic class and then falls—or, if you will, rises—to the position of a machine." ↑ Mikhail Bakunin, The Reaction in Germany, 1842. Retrieved March 29, 2007. ↑ Mikhail Bakunin, La Réforme, On the 17th Anniversary of the Polish Insurrection of 1830, December 14, 1847. Marxists.org. Retrieved March 29, 2007. ↑ James Guillaume, Michael Bakunin A Biographical Sketch.Marxists.org. Retrieved March 29, 2007. ↑ Bakunin, Appeal to the Slavs, 1848, Bakunin on Anarchy, translated and edited by Sam Dolgoff, 1971. Marxists.org. Retrieved March 29, 2007. ↑ Bakunin, Confession to Tsar Nicholas I, 1851. Marxists.org. Retrieved March 29, 2007. ↑ Peter Billingsley, Bakunin, Yokohama and the Dawning of the Pacific. Retrieved March 29, 2007. ↑ Joseph Heco, (Narrative Writer) and James Murdoch (born 1856, Editor), The Narrative of a Japanese: What He Has Seen and the People He Has Met in the Course of the Last 40 Years. (Yokohama, Yokohama Publishing Company; Tokyo: Maruzen, 1895, Vol II), 90–98. ↑ Robert M. Cutler, An Unpublished Letter of M.A. Bakunin to R. Solger, International Review of Social History 33 (2) (1988): 212–217. Retrieved March 29, 2007. ↑ Bakunin, Revolutionary Catechism, 1866, Bakunin on Anarchy, translated and edited by Sam Dolgoff, 1971. marxists.org. Retrieved March 29, 2007. ↑ Bakunin, Federalism, Socialism, Anti-Theologism, September 1867. marxists.org. Retrieved March 29, 2007. ↑ Andrew Flood, Bakunin's idea of revolution & revolutionary organisation published by Workers Solidarity Movement in Red and Black Revolution No. 6, (Winter 2002). Workers Solidarity Movement. Retrieved March 29, 2007. ↑ Bakunin, Bakunin to Nechayev on the role of secret revolutionary societies, FlagBlackened.net. June 2, 1870 letter to Sergey Nechayev. Retrieved March 29, 2007. ↑ Bakunin, Letters to a Frenchman on the Present Crisis, 1870. marxists.org. Retrieved March 29, 2007. ↑ Bakunin, The Paris Commune and the Idea of the State, 1871.marxists.org. Retrieved March 29, 2007. ↑ Robert Graham, Anarchism A Documentary History of Libertarian Ideas Volume One: From Anarchy to Anarchism (300 C.E. to 1939), Black Rose Books. March 2005. Retrieved March 29, 2007. ↑ Bakunin, God and the State, 1882. (quote taken from Michael Bakunin, God and the State, 1916, (New York: Mother Earth Publishing Association) Anarchist Archives. Retrieved March 29, 2007. ↑ Bakunin, Man, Society, and Freedom, 1871. marxists.org. Retrieved March 29, 2007. ↑ Mikail Bakunin. Bakunin on Anarchism. (Black Rose Books. 1980), 369. ↑ Bakunin, Revolutionary Catechism, 1866. marxists.org. Retrieved March 29, 2007. ↑ Bakunin, God and the State, 1882. Anarchist Archives. Retrieved March 29, 2007. ↑ Bakunin, The Structure of the International, Bakunin on Anarchy, translated and edited by Sam Dolgoff, 1971. marxists.org. Retrieved March 29, 2007. ↑ Bakunin, Letter to Albert Richard, Bakunin on Anarchy, translated and edited by Sam Dolgoff, 1971. marxists.org. Retrieved March 29, 2007. ↑ Bakunin, On the International Workingmen's Association and Karl Marx, 1872. marxists.org. Retrieved March 29, 2007. ↑ Bryan Caplan, Dept. of Economics, George Mason University, Anarchist Theory FAQ, Version 5.2, Retrieved March 29, 2007. ↑ Bakunin, Statism and Anarchy, Bakunin on Anarchy, translated and edited by Sam Dolgoff, 1971. marxists.org. Retrieved March 29, 2007. Bakunin on anarchism, edited, translated and with an introduction by Sam Dolgoff ; preface by Paul Avrich.—New York : Knopf, originally published in 1971 as Bakunin on anarchy. Includes James Guillaume’s Michael Bakunin: A Biographical Sketch, Retrieved March 29, 2007. Michael Bakunin: Selected Writings, ed. A. Lehning. New York: Grove Press, 1974. Retrieved March 29, 2007. Anarchism: A Documentary History of Libertarian Ideas, Volume 1: From Anarchy to Anarchism (300C.E.-1939), ed. Robert Graham. Retrieved March 29, 2007. English translations of Bakunin are generally rare when compared to the comprehensive editions in French (by Arthur Lehning), Spanish and German. Madelaine Grawitz’s biography (Paris: Calmann Lévy 2000) remains to be translated. Carr, Edward Hallett. 1961. Michael Bakunin. Vintage Russian library, V-725. New York: Vintage Books. Franz, Edgar. Philipp Franz von Siebold and Russian Policy and Action on Opening Japan to the West in the Middle of the Nineteenth Century. Munich: Iudicum, 2005. Graham, Robert. Anarchism A Documentary History of Libertarian Ideas Volume One: From Anarchy to Anarchism (300 C.E. to 1939). Black Rose Books. March 2005. Writings of Bakunin at Marxist Internet Archive. A biography by James Guillaume. Audiobook of God and the State by Mikhail Bakunin, from LibriVox. History of "Mikhail Aleksandrovich Bakunin"
This page was last modified on 4 October 2018, at 15:28.